SafeDisc retail DRM no longer functions properly on Windows Vista and later (see above for affected versions). Patch 1.04 is the latest patch available for the game]. The executable DevicePicker.exe can be run to skip intro videos. Software renderer for Eagle Watch renders fully opaque windows that enemies can see through. Change the FullScreen entry value from TRUE to FALSE. High DPI causes negative acceleration. Change the MouseRadiansPerPixel entry value. A black screen can sometime occur when running the game. This may be caused by not being able to run cinematics correctly. Skip intro videos to fix this issue. If you see the message Renderer::CreateBuffers() failed during ClearBuffers() : Blt() in file C:\Develop\Common\Renderer\renderer.cpp at line 1330 Error = "An exception was encountered while performing the requested operation." in your Sherman.log file and you are using an Nvidia card, try updating your drivers. This issue is known to occur when using the 331.40 beta drivers and is known to be resolved by upgrading to the 331.65 release drivers. For the optimal experience, either roll back the display driver to a version prior to 13.4 or run the game in a virtual machine with Windows XP. Setup the game to play in a window. 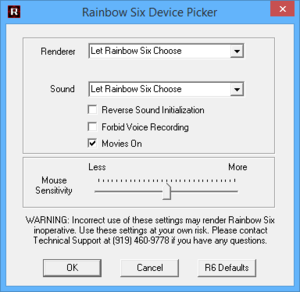 Right click on the RainbowSix.exe file (located in <path-to-game>) and select "Properties". 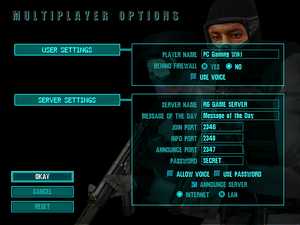 Go to the "Compatibility" tab and enable Reduced Colour Mode (set to 16-bit), along with "Disable display scaling on high DPI settings" and "Run this program as an administrator". Go to <path-to-game>\data\mission and open the specific mission victory conditions text file with a text editor (ex. Notepad). 3. Change the "NUMBER ALL" portion to "NUMBER 4"
4. Save the changes and launch the game. Note that for this fix, Mission 5 on medium difficulty will allow the mission to be completed with the 4 hostages rendered. 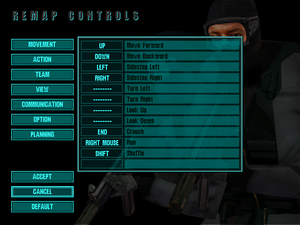 To apply the fix to other difficulty levels, modify the respective text files. 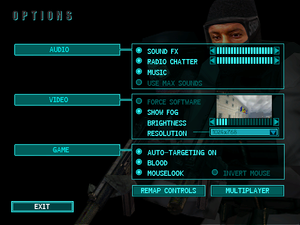 The software renderer in Eagle Watch doesn't support transparent windows, while the main game used a semi-transparent grill to show windows instead. 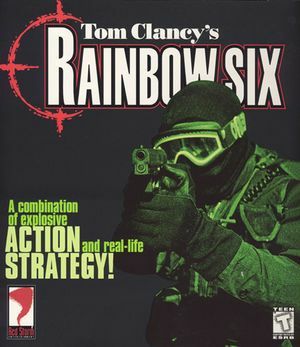 The result is that enemies can see and kill through windows. This only affects old systems without a 3D accelerator. ↑ SafeDisc retail DRM does not work on Windows 10 and is disabled by default on Windows Vista, Windows 7, Windows 8, and Windows 8.1 when the KB3086255 update is installed. ↑ When running this game without Administrator elevation, 32-bit programs writing to HKEY_LOCAL_MACHINE\SOFTWARE will be redirected to HKEY_CURRENT_USER\Software\Classes\VirtualStore\MACHINE\SOFTWARE\Wow6432Node (more details). This page was last edited on 14 April 2019, at 11:34.